Thursday, July 17, 2008: The Billabong Pro JBay Is now complete and Kelly Slater again comes out on top. Slater went up against Mick Fanning in the finals who seemed to be slightly off his game. Wednesday, July 16, 2008: The Billabong Pro JBay Day 7 completed through half of round four today in fun looking JBay. Bede Durbidge, Joel Parkinson, Adriano De Souza and Kellu Slater move on to the quarter finals. Upcoming in Round 4, we will see... More Billabong Pro JBay News, Results, Photo's and Video,,. 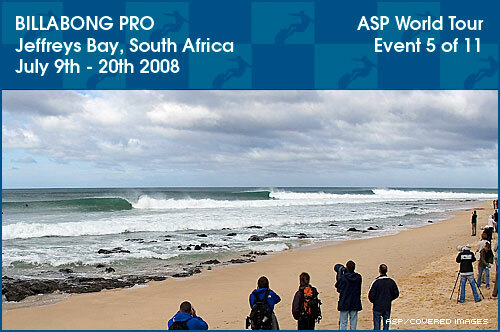 Saturday, July 12, 2008 – Round 3 of the Billabong Pro Jeffreys Bay has been called off for the day. Dying swell has prompted event officials to look deeper into the 11-day waiting period to assess which two days of the eight left will offer the best scoring potential for the remaining ASP Top 45 surfers. Billabong Pro Jeffreys Bay 2008 • Jordy Smith Can't Wait! Tuesday, July 8, 2008 - ASP World Tour rookie Jordy Smith (ZAF) put the world's best surfers on notice when he made the semifinals of the 2006 Billabong Pro Jeffreys Bay as an 18-year-old wildcard. TRANSPORTATION: Definitely a rental car. Beautiful country and you’ll want to be free to get around on the off days. ATTITUDE: There’s an essence that envelops Jeffereys that’s undeniable. Great waves, great hospitality and a great vibe. The flawless waves of "J-Bay" provide a classic canvas on which the surfers can draw their lines and the level of competition jumps accordingly. THE WAVE: Supertubes, Magnatubes, Impossibles and Boneyards are the breaks the boys contest when they come to town. Supertubes hosts the main event and is considered one of Earth’s most epic right-hand point breaks. Racing along a lava-rock reef, the wave churns out section after section of satisfaction should a swell pulse through. PERKS: Flawless waves. Flawless waves. Flawless waves. PERILS: Flick on Animal Planet, watch one episode featuring massive great white sharks prone to propelling themselves in the air and swallowing sea lions whole and then paddle out. Dare you. APRES SURF:Several eating and drinking establishments in Jeffereys do a good night out justice. ASP WORLD TOUR HISTORY: Although Billabong has sponsored an event here since 1983, the ASP World Tour endorsed Jeffreys in 1984, 1996, and again from 1998 to present. Prior to being the Billabong Pro Jeffreys Bay it was called the Country Feeling Surf Classic. NOTABLE: In 2003 Taj Burrow swore he saw a shark during his semifinal heat against Damien Hobgood. While paddling for an outside set, Burrow spotted a massive dorsal fin heading in his direction. Burrow (accompanied by a water photographer) quickly scrambled to the beach where announcers were stating that it wasn’t a dorsal fin, but a whale on its side. A clearly rattled Burrow reluctantly returned to the lineup but failed to attain his needed score. His claim that it was a massive Great White was given credit when, the following week, a South African teen was mauled by a large shark while warming up for an ASP Pro Junior contest.